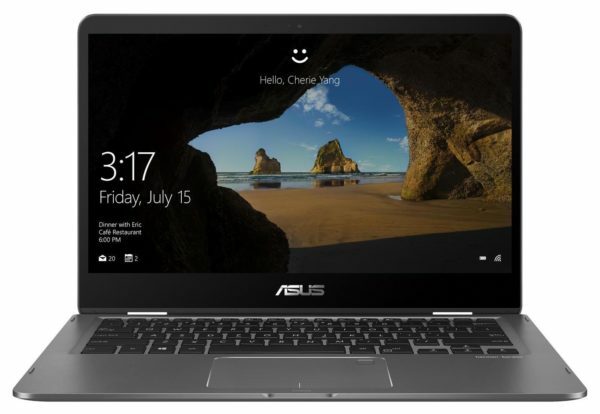 Asus unveils a new desktop and productive version of its high-end Zenbook Flip 14 convertible with the Asus ZenBook UX461UA-E1092T. This 14-inch touch makes the link between mobility and comfort with its spacious screen size and demonstrates high-end capabilities. And for good reason, it is based on a swift base organized around a Kaby Lake Refresh i7 Quad Core, 8 GB of RAM and a dedicated 128 GB SSD, dominated by a beautiful Full HD IPS screen rotating edge to edge (NanoEdge). What’s more, its elegant and discreet gray hull has a backlit keyboard and a fingerprint reader for more convenience. It is displayed at less than 1000 euros . Announced as the 14-inch ultrabook “the finest in the world” (for declination with an MX150), the ZenBook Flip UX461UA-E1092T slips into a 13.9 mm thick aluminum shell and the small weight of 1.4 kg. It’s 6mm and 200g won on the VivoBook S14, enough to go unnoticed in your bag. 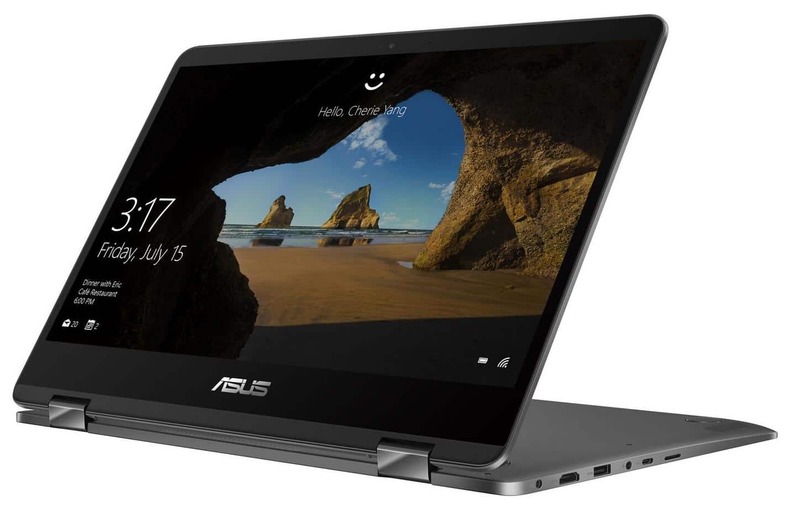 Asus has taken a particular care in assembling and finishing its ultrabook and has chosen a discreet and sober tone for dressing, a dark gray (Slate Gray) plain. The concentric circle design on the lid is typical of the Zenbook series, while the interior prefers a smooth, matte finish. Only the surround of the touchpad scooped with a beveled chrome edge for the chic touch. 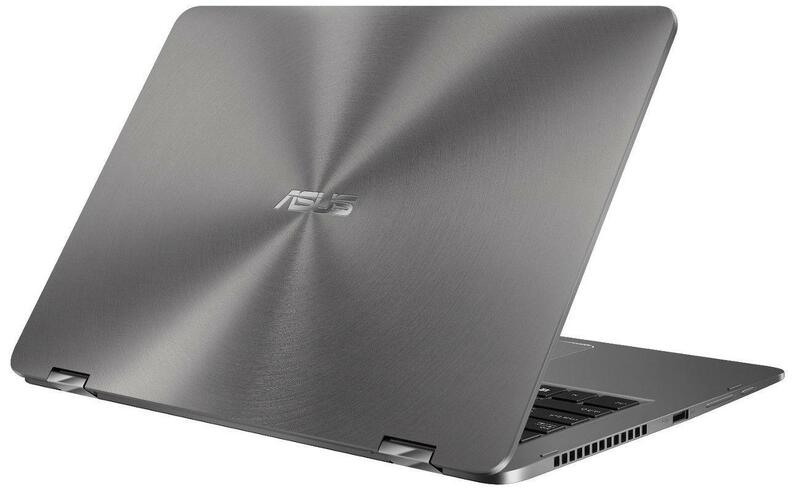 Equipped with the ErgoLift hinge system developed by Asus, the ultrabook opens with one hand and effortlessly up to a 360-degree angle. The screen will thus be able to adopt several positions: opposite for traditional use, flat, tent mode or in the easel function. Also note the presence of a white keyboard backlight system that will ensure a comfortable typing in dark ambience (1.4mm strike stroke). Question endurance, Asus announces a record autonomy of 13 hours. In practice, it would be better to rely on 9 to 10 hours in Internet browsing with active WiFi. The charge is completed up to 60% in 49 minutes. Behind such a slim silhouette, it’s hard to believe that the Asus Zenbook UX461UA-E1092T embeds a level of performance capable of matching a Quad i5-7300HQ. And yet, the arrival of the low-consumption Quad Core i7 Kaby Lake Refresh (8th generation) makes this possible since it will combine Turbo power, low energy consumption and limited propensity to heat. Thanks to him and the 8 GB of RAM that support him, he largely overflows the current use (Internet browsing, Office pack, video playback) and enjoys a large radius of action for more demanding missions (Photoshop pushed , video montage). To avoid spoiling, the RAM in satisfactory quantity ensures a fluid multitasking environment, enough to multiply active applications and / or tabs on the web. In the center of its rotating configuration, the screen is appealing in many ways and particularly thanks to refined edges (NanoEdge) that reinforces the impression of immersion. Its Full HD resolution (1920 x 1080 px) allows to offer a vast display space perfectly net and to make the most of the content in High Definition. Opposite, the IPS technology is responsible for opening the viewing angles and faithfully reproduce the colors. The brilliant slab (inseparable touch) will inevitably produce some glare in bright environment, this is the case on almost all convertibles at the moment. The PC is supplied with an active stylus. Connectivity arrives to reconcile chassis end and correct distribution. There is a microSD card reader, an HDMI output and no less than three USB ports including two USB 3.0 and a USB 3.1 Type-C. A fingerprint reader is added to the batch to allow easy and safe access to its session (Windows Hello compatible). The latest generation of WiFi AC and Bluetooth 4.2 modules are also planned for wireless data exchange faster and more reliable. Weak point of this declination, the 128 GB dedicated SSD does not offer sufficient storage capacity to house your toy library. Indeed, after installation of the operating system (recovery) and programs, there will be little more than 80 GB available. And it is impossible to combine a hard drive in the absence of additional bay. On the other hand, this solution will provide a particularly lively work environment with very low loading times, in addition to being more robust, energy efficient and silent than a traditional hard drive.